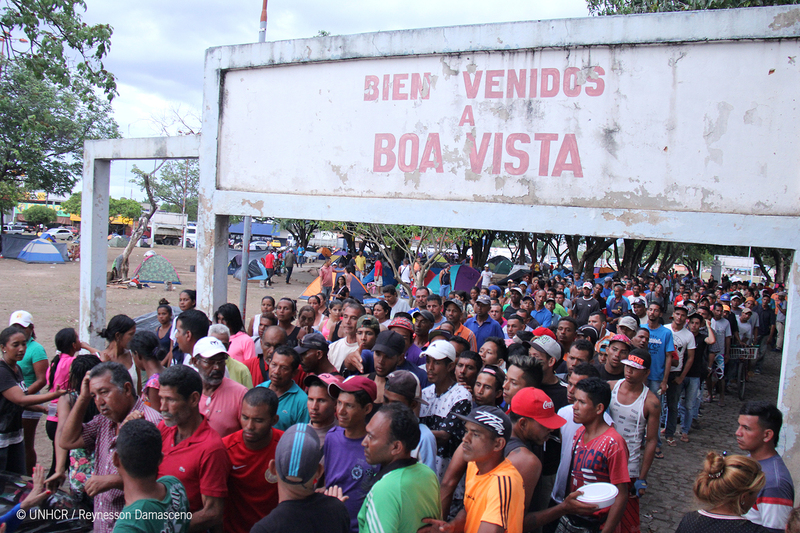 As a consequence of the ongoing economic crisis and social turmoil in Venezuela, an increasing number of Venezuelans are crossing the northern border to Brazil in order to seek asylum, safety and better livelihood opportunities. According to estimates, over 50,000 Venezuelans are living in Brazil currently, of which half in the northern city of Boa Vista, the capital of Roraima state. Out of these asylum seekers, 10 percent are living in public spaces and close to 70 percent remain unemployed. In addition to barriers in accessing job markets, the vast number of Venezuelan face little or no access to humanitarian aid. The government of Brazil declared a state of emergency in the state of Roraima in February, subsequently allocating 190 million Brazilian reals or 58 million US dollars for government actors to carry out operations in response to the crisis. One of the activities conducted by response actors, including the Brazilian Ministry of Defense and UN agencies such as the UNHCR, was the creation of shelters to accommodate and meet the emergency needs of the arriving asylum seekers. As of June, nine shelters have been established with the majority located in Boa Vista, accommodating nearly 4,000 asylum seekers. REACH was deployed to Boa Vista in April in order to support the UNHCR in generating information on the conditions in the shelters and the socio-demographic profiles of the arrivals. Since deployment, REACH has worked on establishing a team of information management experts compiling existing population data in and out of the shelters as well as analyzing geo-spatial data, such as satellite imagery, of each shelter. The first reports by REACH Brazil were published in July, and key findings indicated that 54 percent of the inhabitants of the shelters were men. REACH also found that young children represented a third of the shelters’ inhabitants, out of which the majority were not enrolled in the local education system reportedly due to the lack of space in public schools. Findings revealed that documentation and registration were among key concerns, with less than half of the population of the shelters being registered with local authorities. This has meant that only 43 percent of the Venezuelans in shelters have acquired mid to long-term local documentation and less than one third of new-borns have received birth certificates. When it came to future intentions, the data revealed that a slight majority of the Venezuelans living in shelters were interested in continuing their journey towards other cities in Brazil. Furthermore, REACH found that the current water, sanitation and hygiene or WASH services in several shelters remained inadequate, particularly in two shelters destined for indigenous populations. 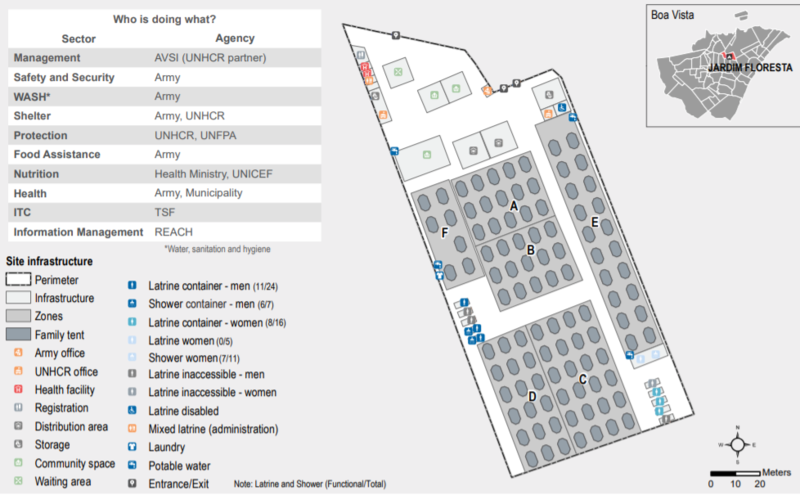 In both of the shelters, the availability of latrines and showers were noted to be below the capacity expected for the number of people living in the shelters. A site profile from the Jardim Floresta shelter. The profiles of the assessed shelters are in constant fluctuation as new Venezuelan migrants and asylum seekers arrive, move between shelters and other cities in Brazil.